Jan 04 15 Watch as Minibar emerges like a fiery phoenix for their first show in...er, a long time. See you at Mrs. Fish in Downtown LA on Wed Jan 7th, 8:00pm. This is a very cool place that supports musicians playing their own music, and there is no cover! The band recommends the fish and chips. See upcoming dates for other details. Sep 23 07 Welcome Minibar back home as they play the ultimate Venice block party. It's free! Aug 31 07 Get a labor day dose of Minibar and Kyra Sedgwick when the video for "Crime Scene Ribbon" is featured on the award winning series The Closer. The episode, titled "Til Death Do Us Part One," airs on Monday at 9/8c or watch online for a limited time beginning the 4th. Aug 05 07 Crazy last minute show! Minibar is headlining Hennessy's Upstairs in Boston tomorrow, see Upcoming Tour Dates for details. Jun 26 07 Attention independent music store junkies! Desert After Rain is now available at CIMS and thinkindie.com stores near you. Ink 19 calls the album "an enduring, memorable album full of atmosphere and evocative lyrics," while PopMatters turns in a likeable 7/10 rating. Check back soon... Upcoming Tour Dates will be yorned again for your summer plans. May 18 07 A certain lead singer celebrated a certain birthday on Wednesday. Although his cake didn't read "26 Today," we wish both Pettys a very happy birthday! This week XM Cafe (XM 45) broadcast Minibar's "Build Your Own Show" in-studio performance. If you missed it, the show does offer encore performances; keep checking What's On My XM to find when it will air again. Deep lyrics, polished harmonies, and thoughts about times long past. Discover what else Pasadena Weekly and Sea of Tranquility think of Desert After Rain. If you haven't seen Minibar play Largo before (or even if you have), we guarantee you will not want to miss the shows on June 5 and July 11. But first, celebrate memorial day weekend with the 'bar at Topanga Days. Apr 13 07 Thank you to everyone who made it out to the CD Release show earlier this week! For those who didn't make it or are simply craving more 'Bar, the band will play an all ages day show at Topanga Days on May 26. Rumors are swirling of potential summer Largo shows followed by more tour dates as Pete Yorn's band. Keep checking Upcoming Dates for details as they become available. We'll make this a short update because you have a lot of reading to do. Catch up with AL.com's Minibar feature, Boston Herald's live show impressions, and Desert After Rain reviews from Amplifier, Melodic, Powerpopaholic, Playback:Stl, and CD-Reviewers.com. Mar 18 07 The snowy tour chuzzles ahead, recently accompanied by a collection of entertaining feature articles from the road. Learn more about Minibar's past and present thanks to Simon's banter with reporters from Journal News, Falls Church News-Press, The Aquarian, and PlayPhilly. Last week bay area fans were treated to "Things I Left Behind" on KFOG's New Music Thursday. Please help keep the song in rotation by calling 1-800-300-KFOG (5364) or sending an eRequest. The station streams online so request away regardless of your location and tune in to hear Minibar! 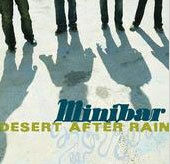 Mar 03 07 As Minibar traverses the country through the end of the month (see Upcoming Dates), plans are in the works back in L.A. for a highly anticipated CD Release show. Mark your calendar for the boys homecoming April 10 at the The Troubadour presented by 89.9 KCRW. While they're still on the road, tune in to NBC and satellite radio for your Minibar fix. You can see them perform with Pete Yorn on Late Night with Conan O'Brien on March 16. Next, the band will record a session with XM Cafe on the 21st. The broadcast date will follow approximately six weeks later. In new reviews, Blogcritics' Tony Harkins affirms that Minibar has the talent to stay away from being a modern folk-rock band cliche while Mile High News writes about "the cockroaches of rock." Jan 26 07 See a trail of staggered footprints and shiny dark black cars with the brand new "Crime Scene Ribbon" video directed by David McGrath. While you tubing, don't miss the debut video by Solomon's Seal--our favourite frontman's side project. You can catch Solomon's Seal live at the Hotel Cafe on February 3. In other side project news, Mal is getting ready to release the next Morello record this spring. Preview tracks from Handheld at MySpace. In the definitely better late than never category, find out Chuzzler's guilty pleasure, his take on America, and much more with Tim's updated Big Ears Biog. Don't be surprised if it's another few years before we receive Sid's answers. If you live in North America, odds are good that Minibar will stop by your town soon while on the road with Pete Yorn. The 'Bar will be Pete's band throughout the tour (beginning Feb 6) and will open for him between Feb 20 and March 31. Get lost in the details with Upcoming Dates. Before you go, check out recent reviews to learn why Desert After Rain is Not Lame and let HUM tell you what you missed on New Year's Eve. Jan 06 07 Tune in to ABC's Men in Trees at 10/9c on Thursday night, the 11th, to witness the television debut of "Can I Call You a Cab?" Judging by the show's music guide, Minibar has some fine company. Don't forget to keep those KCRW requests coming! Jan 02 07 Happy New Year Minibar Fans! And happy early birthday wishes to our favourite bass player while we're at it. We're starting to see Desert After Rain reviews crop up. Take a look at what Miles of Music and The Vail Trail have to say about the record's "well-crafted, honest songwriting" and "harmony-rich laid-back California country" sound. We're happy to report that "Things I Left Behind" and "Crime Scene Ribbon" have seen recent airplay on KCRW. Please help keep them in rotation by requesting more 'bar. It's as easy as e-mailing your request or ringing the station on 310-450-5183. Your requests make a difference so please keep them coming! Dec 12 06 Happy Birthday L.T. Chuzzler! In other news, look no further for your New Year's Eve plans. Bid farewell to 2006 along with Minibar at the Daily Pint. Upcoming Dates has the info you need to start 2007 off right. Nov 22 06 Just in time for your Holiday shopping, you can order Desert After Rain via PayPal. A reliable source tells us that new t-shirts will also be available shortly! Sadly this leg of the Pete Yorn tour has ended, but you can give thanks with some pictures from the Hanford Fox Theatre (Nov 18) and Mystic Theatre (Nov 19) shows. If you have any photos to share, contact us and we'll gladly publish them too. Nov 17 06 If you missed the opportunity to order the advance release, you're in luck! You can both preview and download Desert After Rain on iTunes. Give Minibar your five-star rating by adding a review! Check out this recently uncovered clip from their Music On Demand interview and performance in October 2004. Sep 29 06 Mark your calendars--the official release date for Desert After Rain has been set for November 14. Can't wait that long? Advance copies of the record will be available when the band tours this Fall. If your city isn't listed in Upcoming Dates yet, be sure to check back--more dates will be added soon! To be notified by email of website updates and other band news, put yourself on our guestlist. Sep 21 06 Sweet Home Alabama! Minibar will open for Pete Yorn during a two week run through the south. Upcoming Dates has all you need to know. Sep 18 06 Hot off the Press (almost): We just received word that the new Minibar CD is being pressed at this very moment. Rumor has it that Desert After Rain will be available through CD Baby in November. Rumors of a possible November release show are also in the air--stay tuned for more details. While you're being patient and/or if you feel like fleeing the country, Simon will be at the 12 Bar Club in London on October 3 and Sid/Mal will be down under with PY and the Dixie Chicks from October 6-18. If you feel like staying closer to home, listen for Tim, Mal, and Sid on KCRW's Morning Becomes Eclectic with Pete Yorn on September 27. Aug 20 06 Do you ever wonder why every minibarfans.com update mentions Pete Yorn? So do we. Nonetheless, we are quite proud when we hear PY fans in venues across the country raving about Sid and Mal's talents (and by talents, we do mean Sid's ability to drink, smoke, sing, and play bass simultaneously). Even better than the globe-trotting mini-rhythm section, you can be wowed by the sonic presence of all 4 'bars as they join Pete Yorn at LA's Roxy on the 29th. While they're on a roll, PY's Leno performance on the 30th will also benefit from the entire Minibar. Get your TiVo ready and don't forget to pick up Nightcrawler, featuring Tim, Sid, and a few other people we like too. Jul 25 06 Simon performed at the Lakeside Lounge in New York last month and a savvy YouTuber was there to bring "Crime Scene Ribbon" back to the entire world wide web. Elsewhere on YouTube, watch Malcolm celebrate his birthday center stage in Minneapolis performing Pete Yorn's "For Nancy". Let us know if you have Minibar footage to share! May 30 06 It may seem that Minibar news has been slow lately, but all the kids are getting their 'Bar news at the hip MySpace hangout these days. To catch up, you can still find Minibar most first Saturdays at O'Brien's and Sid/Simon on Sundays at Renee's. If Santa Monica is too far from your hometown, keep checking Pete Yorn's tour schedule to find out where you can see Sid and Mal this summer. Members of the band continue to keep very busy helping other folks out in the studio. Look for contributions from Tim and Sid on Pete Yorn's Nightcrawler due out this summer on Columbia Records. Sid has also been chuzzling away with Ted Brown on his Flaming Pearl release. Meanwhile, Mal is cooking up the next Morello disc and Simon is recording his solo debut with help from Matt Pence (Centro-matic) and our favorite Rockchild. Most importantly, artwork for the band's new CD, Desert After Rain, is underway-- go to the aforementioned MySpace site for a cover sneak peek. If you've been hankering for a Soho Space Jam Freakout but haven't had a 'Bar show in your area recently, kick back with this blast from the past--MP3's from a 2002 Momo's (Austin) show. Feb 28 06 Minibar has been holed up at Would Work Sound in North Hollywood to finish the record with Evan Frankfort (a minibarfans long time favorite). They'll escape from the studio to play a show with The Shore at El Cid on the 3rd.